AWWW ES HERMOSO!!! ♥♥♥ Todas sus fotos son hermosas!!! OMFG this is the cutest thing I've ever seen. A-FRICKIN-DORABLE!!! Looks like my dog when he was a puppy. Oh my gosh, your bulldogs are soooo cute. Whenever I see a picture of them I just give the biggest 'AWWWWWWWWWW!' ever. I love your gallery of them. I cannot wait to own a bulldog myself. i am a big dangerous doggy yes i am!!! i kill with my cuteness!!!! >O< ROWR!!!!!! How adorable! My parents have a white bully named Abigail. Yours is super cute (cuter than my parents' haha). This photographs is beautiful. Please give me this pup! I simply adore him! awww how adorable!!! what a beautiful puppy!! Aww que hermoso! ^^ es tu perrito? he's absolutely one of the cutest puppies i've ever seen. i just want to hug him, haha. That's probably the cutest thing I've seen all day. how cute! I had a bulldoggie myself and they are so adorable! Little button...I want to squeeeeze! is that poochi yours?! 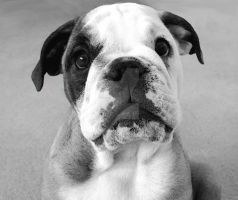 I love English Bulldogs and wanted to know how they behave genrerally?